Spring is here and it’s the perfect time of year to fit some education into outdoor activities! There are opportunities everywhere, you just need to know where to look. 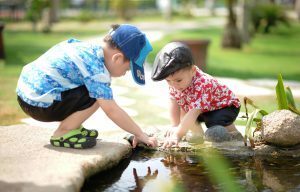 Here are 5 ways to combine fresh air, playtime, and early learning activities. Scavenger hunt: A scavenger hunt is a great way to get out and enjoy the beautiful spring weather. Mix it up by searching for different textures, colors, or things that start with certain letters. Check out these Scavenger Hunts for Preschoolers for some great ideas including indoor scavenger hunts for rainy days! Science Experiments: Hands on science experiments are excellent learning experiences and tons of fun for the little ones. This super easy volcano experiment is perfect for little hands and requires NO clean-up! Visit us on Pinterest for more awesome Science Experiments for Kids! Nature walk: An everyday walk can easily become a learning experience. Whether you’re taking a quick walk through the neighborhood or a hike in the woods, there’s plenty to explore. Check out these tips from the National Association for the Education of Young Children to make the most of your nature walk! Collecting & Sorting: Items such as rocks, leaves, and flowers collected during your nature walk or scavenger hunt can be saved for new activities. They can be sorted by color, size, shape, or texture. As an added bonus, they can be used as an art lesson afterwards. Visit our Outdoor Art for Kids board for ideas! Gardening: Kids love to play in the dirt, why not get something out of it! Gardening offers a variety of learning experiences including science, math, and motor skills. If you don’t have room for a garden, you can grow many kinds of flowers and veggies in pots filled with a bit of potting soil. Click here to learn 10 Ways for Preschoolers to Learn and Grow in the Garden. Follow us on Pinterest and Facebook for more tips and tricks for parents of preschoolers! Categories: Family Fun, Tips for Parents. Bookmark the permalink.